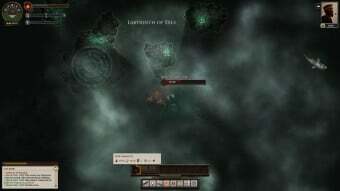 One of my favourite games of all time is FTL, Faster than Light. It’s a game where you take your spaceship through a bunch of sun systems to escape the Rebels. 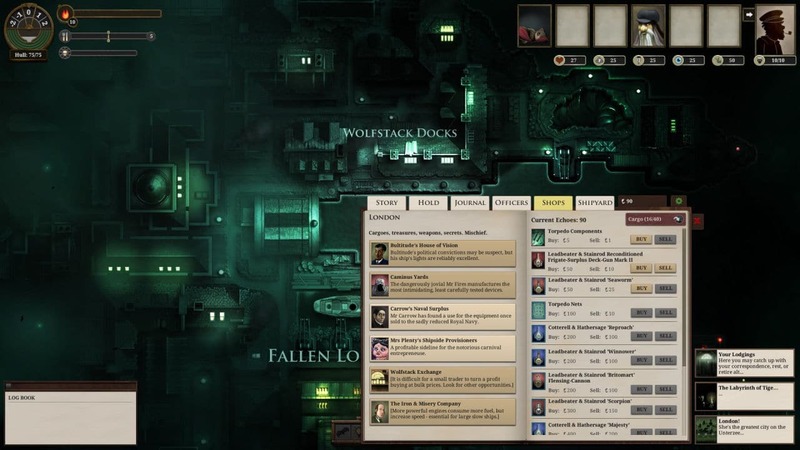 It’s fun and it has limitless replayability as you most certainly die or even when you finally win, you want to do it again since each play through is different. 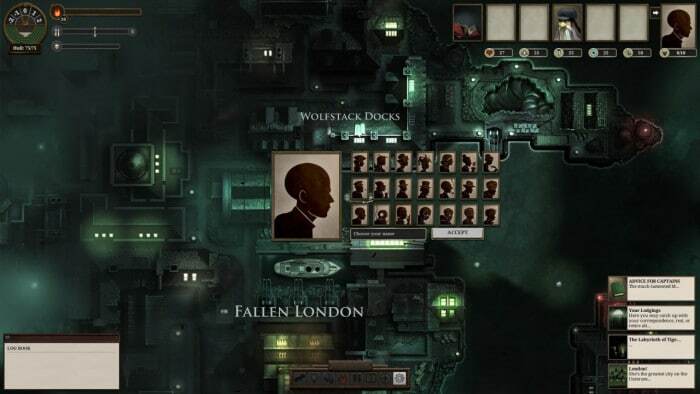 Sunless Sea is a game that reminds me a lot of FTL, although set in an alternate reality where in the 1800 London fell through a hole in the ground into the underground and you now sail around a sunless sea (the unterzee) with your ship. It’s a game that won’t satisfy those gamers who just want action but which offers a lot for the gamer who is after an exploration game. 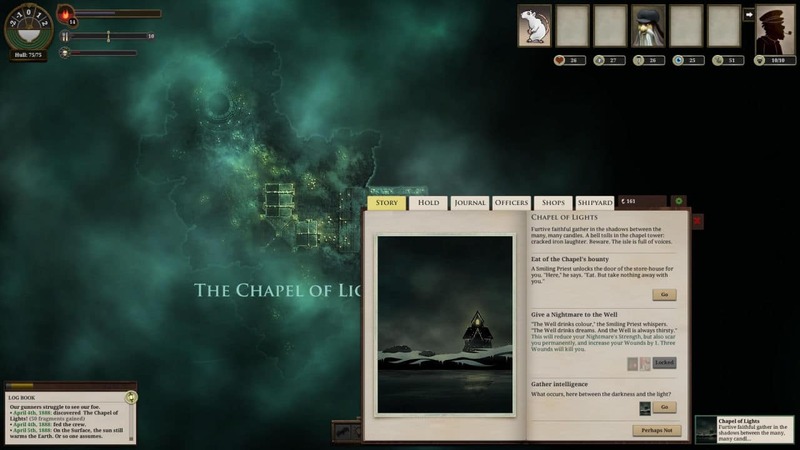 The first thing you will do in Sunless Sea is decide your past. There are a few selections being made at the start (you can skip those and make them later) which will affect some of your stats and what happens in the game. Are you an old veteran or a poet? This will shape your game. You also get to decide what your motivations are. Do you sail on the sea because you want wealth or do you want to know what happened to your father? Again this will affect the game. As London was swallowed by the whole it settled at the big sea (unterzee). As expected nothing is as before and there is islands dotted around the whole sea that you can explore and discover. 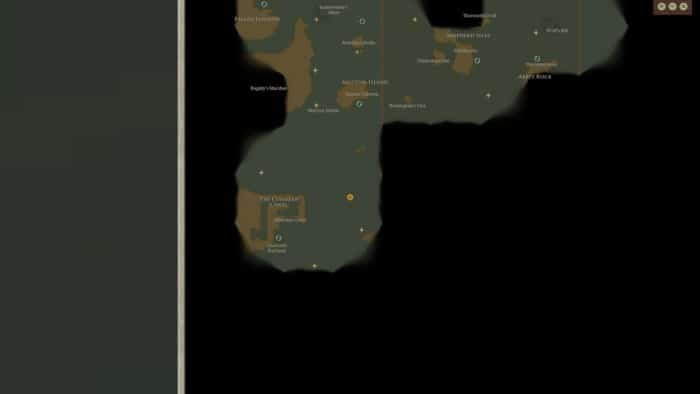 Each “new” game (not counting when you die and continue with a new captain) is unique although some of the closest islands are roughly at the same spot. You start the game with a small ship that has a limited amount of space for goods, guns etc. During the game you can upgrade it both with a new ship but also new guns etc. You also can hire new officers that give you extra boosts in different areas. the ship is controlled via the WASD-keys. you have two speeds forward and two speeds backwards and steering is not instant but feels like it should with a ship. Depending on the uns you have you see a firing arc that shows you where you can fire in the cases that you have to fight. Only when the enemy is in this arc will your crew be able to aim. True, you can shoot even if they have not finished aiming but you probably miss. 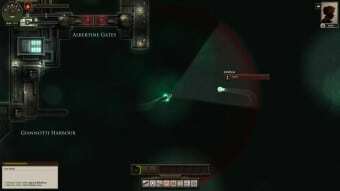 As mentioned before this is not an action game. 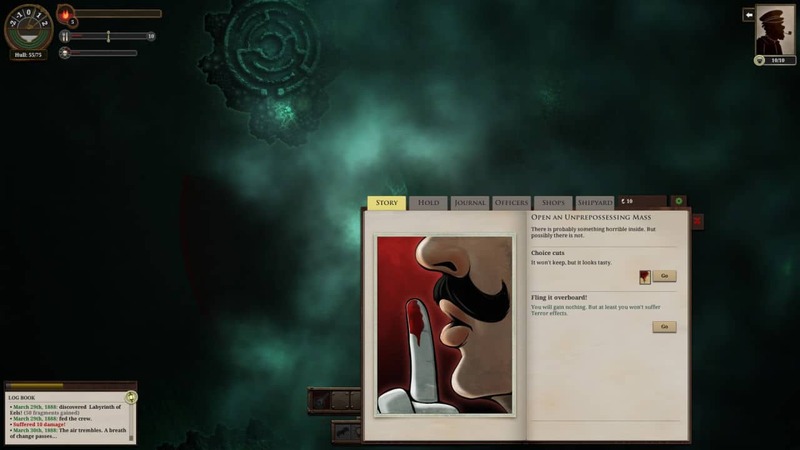 It is a game with a slow pace and a lot of conversations. You spend just as much time reading as you do traveling on the sea (or zee). Every port has its own story and depending on what you choose to do new opportunities open up and others close. In fact, you have to visit some places more than once to really find out everything that happens. The stories themselves are a big part of what makes the game great. For example I visited an island, I forgot the name, out in the ocean where rats and guinea pigs were at war. Should I support the rats that were great engineers and had built weapons or the guinea pigs that instead were more aristocratic and relied on numbers? Or should I try to broker a peace? in the end I decided to support the rats and manged to surprise the guinea pigs and kill a lot of them and destroy their ships. In another instance I visited 3 sisters on an island (they are odd ….) and had no fuel left. I decided to take up the offer to make an offering to one of the gods and were whisked away to the absolute opposite of the map with no hope of escape and big giants looking down on me. That was the first time I died …..
As much as I love the conversations and stories some things could have been made better. It is sometimes hard to follow the conversations and stories as they are told in a relatively small window. It feels annoying that the game cannot take advantage of a big screen. the text also sometimes is hard to follow as when you make a selection and something happens and new text appears it is added at the bottom making you have to find where new stuff has been added. Quite simply the whole text-handling could have been made a lot better. One of the main “features” of the game is that you really have to household on your resources. Fuel and food are the main resources which keep your ship and crew going. Run out of fuel and you get stuck in the waters, run out of food and you might have to eat one of your crew. This makes it imperative that you keep an eye out on both resources while going out to see. You constantly have to calculate how far out you can take your ship and if you can find a port where you can get filled up, often at much higher prices. Food can somewhat be handled by killing sea monsters but it often means you ship gets damaged which in the long run is disastrous and cost you a lot. 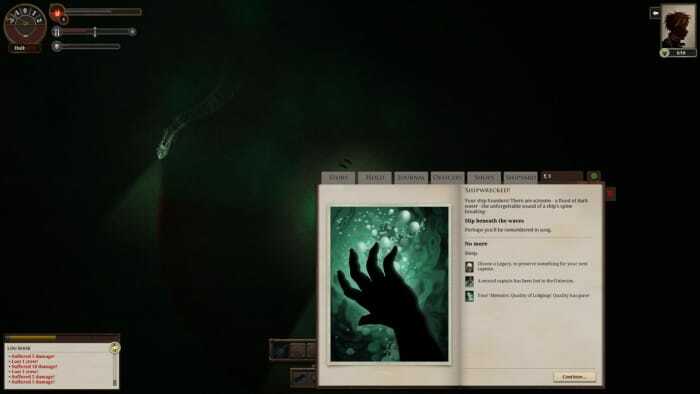 Sunless Sea is neither beautiful or ugly, its visuals are just right. 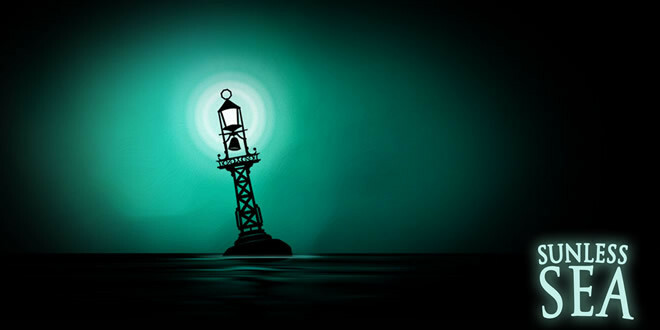 It’s gloomy, dark and mysterious and especially when you turn off your ship-lamp and sail into the mist it gets almost a bit creepy. The music and sound add to the creepiness and changes between almost silent to nice dark music. If you die, and you will do it a lot of times, your old captain will live on as a memory and legacy. Depending how far you got you might even inherit a map, a boat and other stuff from him. This means that even as you restart the game as a new captain your previous captains still are important and will help you with your future games. 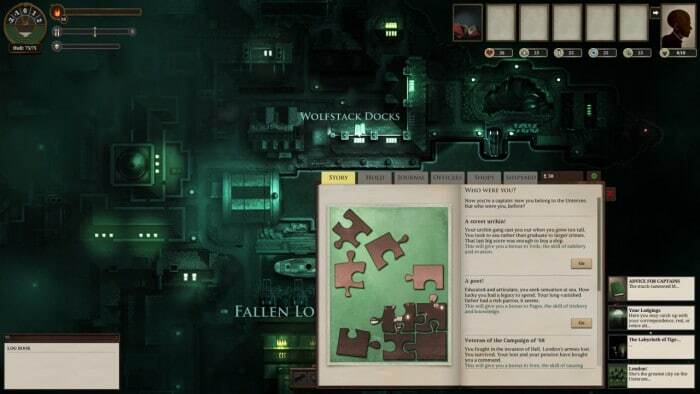 Sunless Sea was funded using Kickstarter (just as FTL was) and thus was developed together with the community. 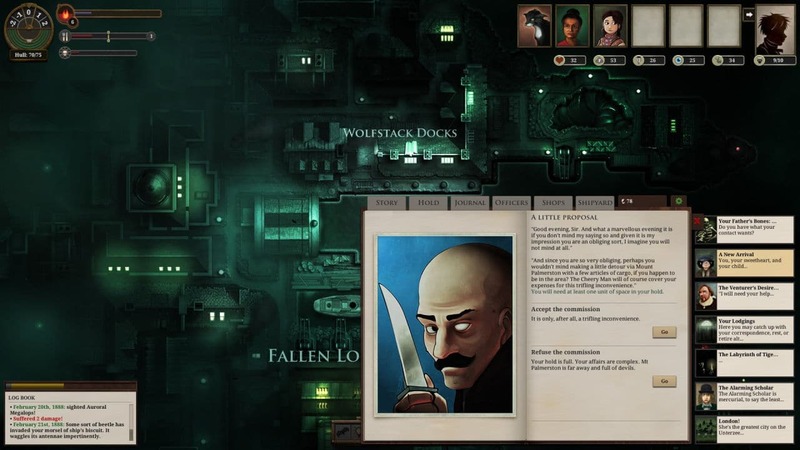 It is an excellent little indie-game that simply is wonderful to play, as long as you know what to expect. 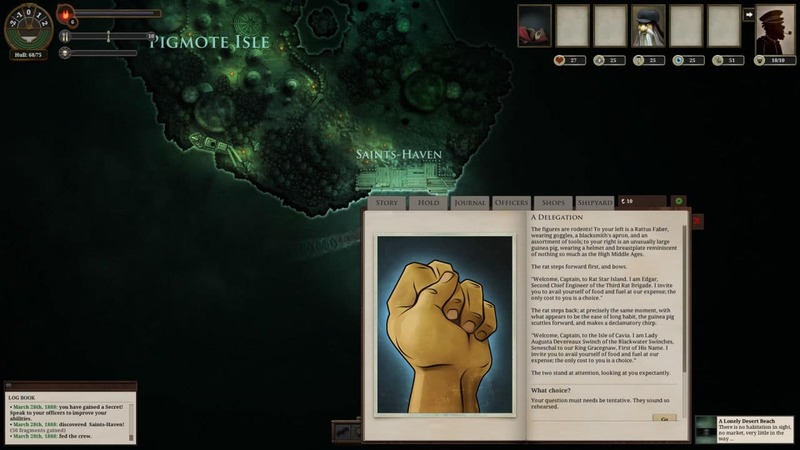 The few issues we have with the way text is presented are minor and does not detract from the excellent game. It can be very frustrating when you know you are low on fuel and/or food and having to go back to London over and over again but this also adds to the feeling of helplessness and mystery. It is a game we cannot recommend enough. The game can be bought from Steam and Humble Bundle Store and is well worth the asking price of around 17-18€. Sunless Sea is an excellent Indie-title that combines exploration, terror and interesting stories. 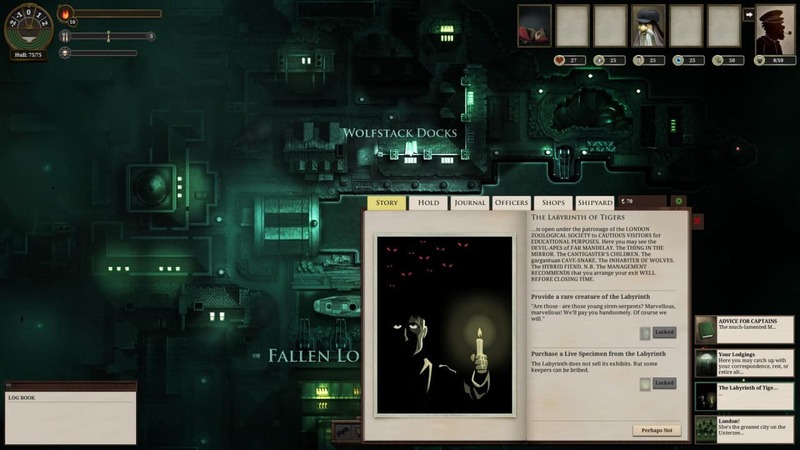 It's a game where dying is not the end, just a stop on the way. Valve releases game streaming over local network!